The proposal by Caltrans to construct the replacement for the Greenwood Bridge with 1) no sidewalk, 2), the ST-20 railing 3) and 8' shoulders should be amended. 4. Require that the shoulder width be narrowed from 8' to 4'. The lack of sidewalks goes against the commission's support for the California coastal trail. This bridge will be part of coastal trail and should provide for safe pedestrian use. The Greenwood Bridge is near the town of Elk and is used by local citizens. Lack of a sidewalk endangers pedestrians. Why a two-rail system with the ST-10? 1. National safety standards (the "AASHTO" standards) subscribed to by California say that pedestrians on bridges shall be protected from vehicles when the highway is designed for high speeds (50 MPH or greater). This protection requires a traffic barrier on the traffic side of the sidewalk. The Greenwood bridge, with its 11-degree banking slope, is designed for vehicle transit greater than 50 MPH. Because the bridge will be occupied by pedestrians, the proposed use of a combination vehicle-pedestrian-bicycle rail, the ST-20, on the Greenwood Bridge is contrary to AASHTO standards. The AASHTO standards limit use of a combination vehicle-pedestrian rail placed on the outer edge of a bridge, "to roads designated for 45 MPH or less." Another ASHTO document says, "For speeds of 50 MPH or greater, pedestrians should be protected by a separation traffic barrier." 2. The AASHTO standards for pedestrian protection can be met by using the two-rail system so successfully employed on the new Noyo Bridge. The inner rail is an ST-10, which has a low height and good visual transparency. 3. The use of an inner rail, together with a 4' shoulder to be used by bicycles, will allow the outer rail to be a pedestrian railing. This will greatly improve scenic viewing and bridge aesthetics. Why a newly designed railing? 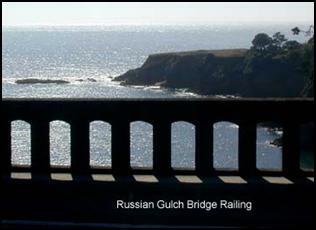 A new pedestrian railing needs to be designed for coastal bridges. 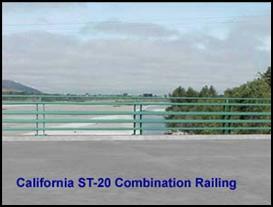 The ST‑20 railing proposed by Caltrans fails to embody the recommendations the Commission made to Caltrans in June, 2001. The ST-20 railing is 54" high, creating visual obstructions for cyclists and pedestrians, without protecting them from traffic. The railing lacks any architectural merit. The ST-20 railing need not and should not be used on any bridges in the coastal zone. · Curved and arched elements should be explored, in order to make the rail design as graceful and attractive as possible. · Because of the loss of many historic and attractive bridges throughout California, a new rail design should seek to incorporate elements of historic bridges where consistent with modern safety standards. A pedestrian railing could easily incorporate curved arches that would reflect the arches that were incorporated into railings of the historic arched, concrete bridges of Highway 1. A Policy on Geometric Design of Highways and Streets, AASTO (1990), cited in ibid, p. 13-6. Letter to Caltrans Director Jeff Morales from Sara Wan, Commission Chair, June 29, 2001. The arched railings would provide a link to the historic past. They would provide a feeling of tradition, as well as aesthetic beauty. Examples of such railings are shown below. 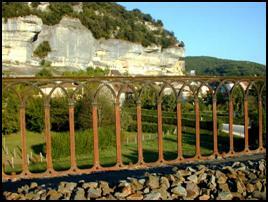 These railing are on bridges in France and are of cast iron. Alternative materials could be used, although cast iron would be structurally adequate for pedestrian railings. 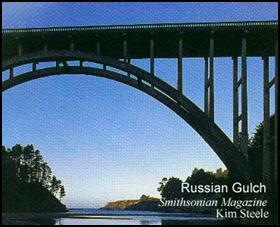 The original Hwy 1 bridges have arched designs and arches in the railings, as shown in the photos below of the Russian Gulch Bridge in Mendocino. Why narrow the shoulder width? 1976 Coastal Zone Act, Section 30254.
meters (32’), in rural areas would be inconsistent with the Coastal Act and the Local Coastal Plan of Mendocino County." The bridge as proposed would be 40'. 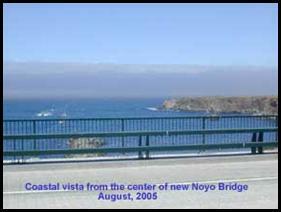 Reducing the shoulders to 4' would put the bridge at the width limit of the Coastal Act and the Mendocino Local Coastal Plan. 2. Narrowing the shoulder would provide room for a sidewalk without widening the bridge beyond the proposed width. The sidewalk with an inner barrier would provide safe pedestrian use. 3. A narrower shoulder would help slow down traffic on its approach to the village of Elk, a rural community that has Hwy 1 as its only main thoroughfare. 4. The proposed shoulders would be 60 percent as wide as the traffic lanes. They would make the bridge more like a high-speed expressway than a "scenic two lane road." 5. A narrower shoulder would still be wide enough to provide safe bridge transit for bicyclists. 6. A narrower shoulder would better match the almost non-existent shoulders on most of Hwy 1. 7. Eight-foot shoulders are suited to high-speed urban roads. They are completely inappropriate for rural sections of historic Hwy 1. They are out of character with the Hwy 1's rural, scenic character. 8. The widening of the shoulders for the bridge approach contradicts another Caltrans policy: avoiding variations in highway width – a policy cited by Caltrans in justifying 8' shoulders on the Noyo Bridge. 9. Eight-foot shoulders on the bridge would be inconsistent with the remainder of Hwy1. Hwy 1 has almost non-existent shoulders throughout most of Mendocino County. The shoulders will be as wide as they are on the bridge approach only because Caltrans plans to widen the approaches for this small section. 10. Given the overall dangers of driving on Hwy 1, the incremental improvement in safety from a few hundred feet of 8' rather than 4' shoulders would be insignificant. Why ignore Caltrans safety arguments? Caltrans will argue that 8' shoulders are its design standard, based on safety considerations. The commission should not accept this argument. There are no "absolute safety standards" that must be met, regardless of other considerations. National and state design standards give Caltrans wide latitude to accommodate special situations. Preserving scenic values is widely recognized as an important reason to use this flexibility. In passing the Intermodal Surface Transportation Efficiency Act (ISTEA) of 1991, Congress emphasized, in addition to safety, the importance of transportation design that is sensitive to its surrounding environment, especially in historic and scenic areas. Route Concept Report Route 1 Corridor, Caltrans District 1, September 2003. In support of the 32' limit, this quotation cites: Mendocino County General Plan, Coastal Element, adopted August 17, 1983, p.107, section 3.8-6. Caltrans has total authority to make exceptions to any of its design standards when the project is not part of the interstate highway system. Caltrans recognizes that design standards will not always be met. It devotes an entire chapter of its Project Development Procedures Manual to exceptions, and a section to "Exceptions to Mandatory Design Standards." Obtaining an exception on a project is straightforward. The reasons for exceptions must be documented, and the request must be approved by the Project Manager and the Design and Local Programs Program (DLPP) office. The DLLP authority has been delegated to local district coordinators, who provide the highest level of approval for design exceptions. 2. Caltrans has made an exception to its current design standard of 8' bridge shoulders on at least one other project. Highway 150 in District 5 had two bridges replaced recently. The bridges were designed originally with 8' shoulders, but after Santa Barbara agencies opposed the width, Caltrans narrowed the shoulder width on these bridges to 4'. These bridges have now been built (on an emergency basis) with the narrower shoulders. 3. Caltrans has recently changed its standards with respect to bridge railing design, demonstrating its flexibility in design standards. When the Commission was considering the Noyo Bridge railing, Caltrans design standards required less than 4" spacing between rails less than 32" from the surface. In response to public desires for more visually transparent railings, Caltrans has changed the required spacing to less than 6". The ST‑20 railing has the new 6" spacing. 4. There are no national design standards that mandate 8' shoulders for bridges. To the contrary, the AASHTO design standards specify, "The roadway width [of a bridge] shall generally equal the width of the approach roadway section including shoulders." Note that this is not a rigid requirement and only a "general" guideline. For a structure somewhat like a bridge, a highway underpass, AASHTO standards require only minimum 2' shoulders. Caltrans disregards national standards when it suits its purposes. The approach to the proposed Greenwood Bridge will have one 8' shoulder (on the east side) and a 4' shoulder on the west side. AASHTO design standards specify, "The roadway width [of a bridge] shall generally equal the width of the approach roadway section including shoulders." 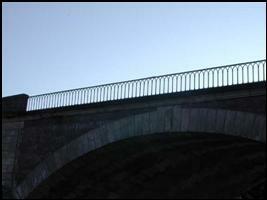 However, on the west side, the width of the bridge shoulder will be twice that of the approach shoulder. Flexibility in Highway Design, Federal Highway Administration, Publication Number FHWA-PD-97-062. SECTION 1 - Exceptions to Mandatory Design Standards, Caltrans website: www.dot.ca.gov, 2001. Roberto LaCalle, AASHTO Engineering Services Coordinator, California Department of Transportation, telephone communication, September 6, 2005. Ibid, Chapter 2, "General Features of Design," Section 2.3.1, p. 8. 6. A safety argument is not supported by Caltrans shoulder treatment in other, far more dangerous situations. Numerous 8+-lane freeway segments do not have an inner shoulder. I recall when Caltrans converted the inner shoulder to a traffic lane on congested high-speed L.A. freeways. The Greenwood Bridge will set a precedent for future bridges to be constructed by Caltrans on Hwy 1. · Require a sidewalk to protect pedestrians and further the coastal trail. · Require use of a two-rail system to protect pedestrians and to provide for optimal railing aesthetics and motorist views. · Require use of a newly designed scenic pedestrian rail acceptable to the commission. The two-rail system with an outer pedestrian rail will provide wide latitude for designing a rail incorporating curves, arches, and historical elements.